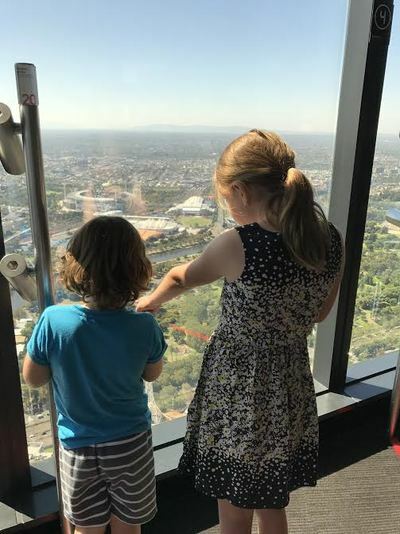 Yesterday, the Wilson’s headed up to the 88th Floor (285 meters above sea level) of the incredible Eureka Tower to visit the famous Eureka Skydeck! This Melbourne icon is 297meters high, gold plated and stands proud next to the Yarra river. You can’t, miss it, and you definitely don’t want to either. The lift is so incredibly fast; you arrive at the 88th floor in no time at all, with ears that need popping. We stepped out of the lift, a little apprehensive about the height; we all gasped. The view is not only breath-taking, but the Eureka Skydeck is by far the best observation deck we have ever been in. And we’ve been in a few. There is so much to see, to learn and to photograph. Happy children pointing out the sights! As the highest public observation deck in the Southern Hemisphere, Eureka Skydeck offers a visual masterpiece. You get to see Melbourne from the best vantage point. The little telescopes they have highlighting the main attractions in Melbourne are wonderful. Monty spent ages staring down at the MCG. Happy cricket fan right here! It’s a great way to get your head around where things are in relation to everything else. Great for everyone, tourist or local. The telescopes were a hit! Once we had made our way around the viewing deck oohing and aaaaahing, we headed to ‘The Edge’. We were all a little apprehensive when we were asked to put covers on our shoes so as not to scratch the glass, and kindly asked not to jump or take any belongings into the box. Here goes! This is the world’s first and only Edge Experience – we were in a glass cube that projects out from the 88th floor, with a little shuddering and pretty terrifying sound effects. 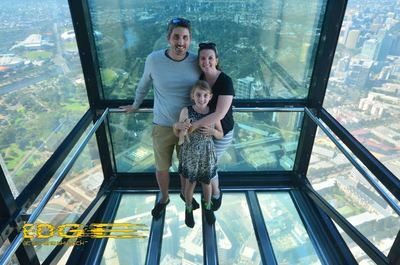 It only took a few seconds and The Wilsons were suspended almost 300 meters high above Melbourne city. I know! The Edge! The best family adventure in Melbourne! ♣	Eureka used 110,000 tonnes of concrete and weighs 200,000 tonnes. 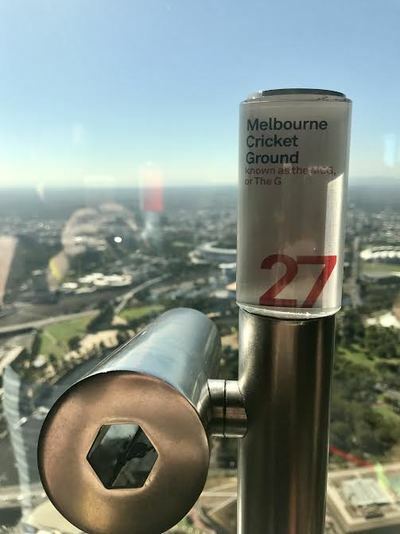 There is so much to see (the whole of Melbourne), and do at the Eureka Skydeck. You really need to grab the kids, bundle them into the car and go. The Easter school holidays are looming and for those of you who have few plans, Eureka Skydeck has some ideas. Once again Eureka Skydeck has teaming up with Crayola to invite kids to take part in FREE Easter-themed activities, every day between 11am – 3.30pm. From 1 April until 17 April, Eureka Skydeck will have a Crayola Kids Zone filled with fun craft and drawing activities, including bunny-ear making and the opportunity to scribble on windows. 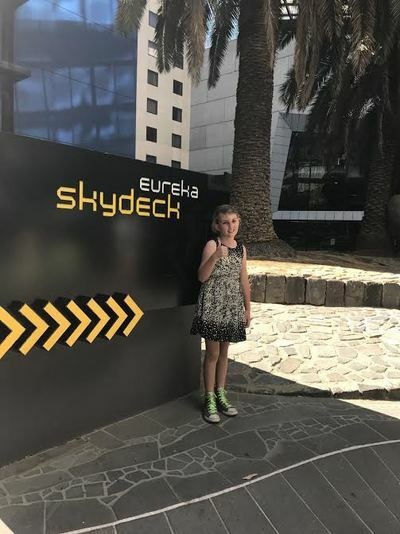 Eureka Skydeck’s much-loved mascot, Deckstar, will be stopping by each day to keep everyone entertained during the first school break of the year. Eureka Skydeck is definitely worth a visit. Head to the website for more details on upgrading your tickets.